Florida’s abundance of coastline and waterways provide endless opportunities for recreation, but also offer dangers. Boating accidents, such as collisions, drowning, or other injuries can occur for a variety of reasons, including driver inexperience or error, intoxication or other impairment, unfavorable water or weather conditions, poor boat maintenance, equipment defects and failures, and poor planning. The owner of a boat and its operator must exercise great caution to prevent injuries to passengers, swimmers, or others in the surrounding area. This includes any type of water vessel, like ferries, cruise ships, power boats, sail boats, jet skis, canoes or kayaks, or others. Owners and operators are expected to follow boating safety rules, take necessary precautions to avoid accidents and injuries, make sure the vessel is properly maintained and carries all appropriate safety equipment, and to be careful around swimmers and other boaters. For a boating accident to be classified as “reportable” in Florida, it must involve a person’s death, a person’s disappearance in circumstances that suggest possible death or injury, an injury requiring medical treatment, or more than $2,000 in property damages. Injuries sustained can be as minor as bumps and bruises that heal quickly, or as severe as broken bones, lacerations, brain or spinal cord injuries. Some injuries can even be fatal. A severe injury can be life-altering, requiring expensive medical treatment and rehabilitation, or even cause permanent disability. These extensive injuries can financially devastate families. 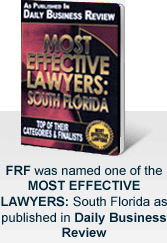 If you or a loved one suffered a catastrophic injury in a boating, yachting, or personal watercraft accident, you need to seek compensation to help you recover, and the experienced Miami boat accident lawyers at Friedman, Rodman, & Frank can help you. Assess your current condition and make sure you have proper access to medical care. We’ll help you navigate the complicated bureaucracy of medical and insurance providers. Document your medical condition by working with your doctors and other health care experts to get the information needed to prove your injuries. Consult with specialized experts to identify faulty equipment or prove negligence by boat operators. Our extensive technical and medical knowledge will help us understand your losses, associated damages, and current and future needs. We’ll use the information we compile to help you obtain the compensation you deserve. If you believe the negligence of a boat operator caused you to suffer an injury, or caused the death of a loved one, contact the South Florida law offices of Friedman, Rodman, & Frank immediately at 305-448-8585 or toll free at 877-448-8585, or complete our online form for a free consultation in English, Spanish, or Creole. We have extensive experience in handling boating injury cases in Miami and across South Florida, and we can help you protect your legal rights and hold any negligent parties responsible for your injuries or losses.